Dev Deepawali or Dev Deepawali in Varanasi is celebrated on Kartik Poornima, the full moon of the Hindu month of Kartik, fifteen days after Diwali. Dev Deepawali is not standalone, in itself. It is celebrated on the last day of Ganga Mahotsav, which begins on Prabodhini Ekadashi (11th day of the Lunar month of Kartik) and ends in Dev Deepawali which will fall on November 22 this year. It is interesting to note that Dev Deepawali in Varanasi also coincides with Guru Nanak Jayanti and Jain Light Festival. Not to be confused with Deepawali (or Diwali), Dev Deepawali or Dev Diwali in Varanasi is a festival celebrated every year on the occasion of Kartik Poornima. This happens to be 15 days after Diwali. This year, Dev Deepawali in Varanasi will be on November 22, 2018 (Thursday). For most travellers and spiritual seekers alike, Varanasi is a dream destination. People from all over the world come and stay in this city for days, seeking spiritual peace, meditating on the banks of the Holy River Ganga and paying several visits to the temples in what is popularly known as the city of temples. Dev Deepawali in Varanasi or Dev Diwali is that time of the year when Varanasi truly seems like an abode of the Gods, not just of temples. Often known as the City of Light, Dev Deepawali is probably a manifestation of this very epithet. The traditional plan of events for Dev Deepawali in Varanasi is quite elaborate and is followed religiously every year. The ceremony starts with the offering of prayers (Ganesh Vandana) and flowers to Lord Ganesh. This is followed by the offering of lit earthen lamps or diyas, known as deepdaan, by 21 Brahmins and 41 young girls with the chanting of Vedic mantras in the background. A lot of devotees take a dip in the river Ganges on this auspicious day, known as Kartik Snan. This ritual is believed to rid a person of his/her sins. Many households also organize Akhand Ramayan (chanting of the holy scripture, Ramayana) followed by Bhoj where food is offered to people. Apart from having a religious tinge to it, martyrs are also remembered at the ghats. This is done by praying to Ganga Mata and by offering an aarti to her. This is organized by Ganga Seva Nidhi when wreaths are placed at Amar Jawan Jyoti at Dashashwamedh Ghat and also at the adjoining Rajendra Prasad Ghat by police officials, and also the members of the three armed forces. To mark this event, patriotic songs are also sung. Dev Deepawali is a spectacle worth beholding in Varanasi. Every ghat and temple in the Holy City is alight with earthen ghee diyas. Whether the stars have found their way down to the Earth or not, one can hardly say. It is believed that the Gods descend to Varanasi on this auspicious occasion to take a dip in the River Ganga. This is what makes this festival so popular. Tourists from all over the country flock to Varanasi during this auspicious festival. 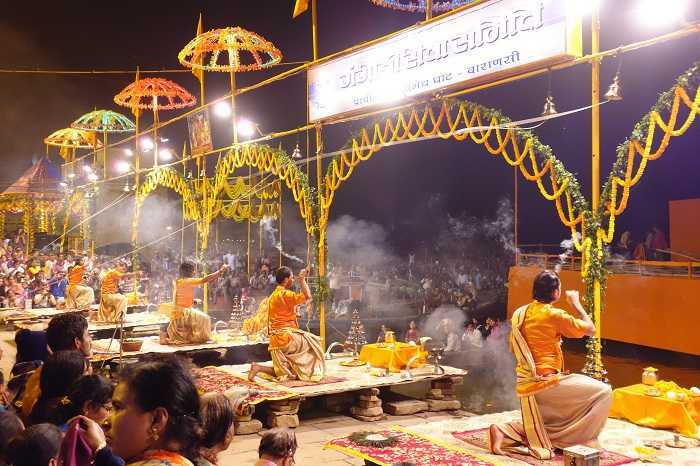 On the night of the main festival, thousands of people, locals and tourists alike, come to watch the spectacular and elaborate aarti at the river ghats. With thousands of diyas lit all over the place. The view is rather enchanting and magical, despite a large number of people. If you thought Benares was the champion of Ganga Aarti, wait till you attend the Ganga Aarti on Dev Deepawali in Varanasi. The ghats are seen to be teeming with people from all over the country and the world, but the crowded Dashashwamedh Ghat is in no way devoid of excitement or enthusiasm. The Ganga Aarti you will see on the evening of Dev Deepawali is the most elaborate Ganga Aarti that is performed during the whole year. 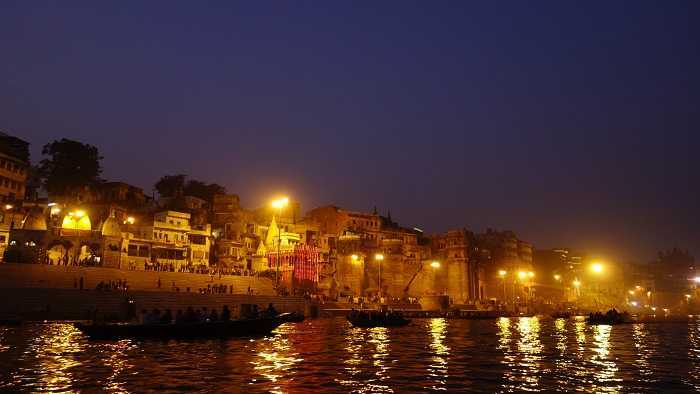 You will soon grow tired of counting or imagining the sheer number of earthen lamps on the ghats and will be taken aback by the exquisite beauty of this particular evening in Banaras. The evening aarti at Assi Ghat is the next hotspot for visitors to flock. Reeva Ghat, Man Mandir Ghat, Kedar Ghat and Panch Ganga Ghat should also be visited on the evening of Dev Deepawali in Varanasi. Ganga Mahotsav, as stated earlier, begins on Prabodhini Ekadashi and goes on for five days. Life and culture in and around Varanasi is believed to be blessed by the Holy River Ganga. Ganga Mahotsav is celebrated as a token of thankfulness of the people towards the bountiful river. 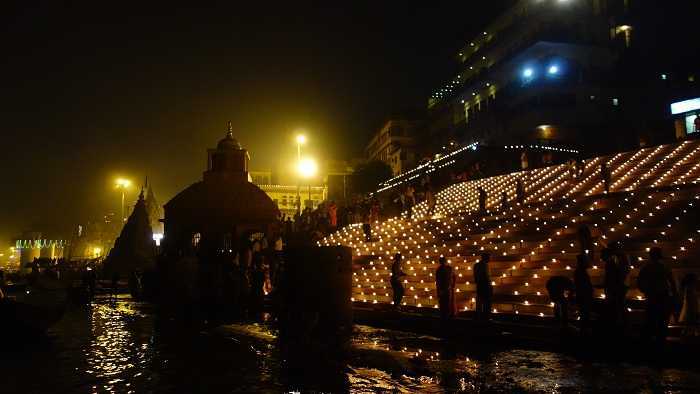 Ganga Mahotsav is typically held at the Dashashwamedh Ghat but has recently been shifted to the Ravidas Ghat. 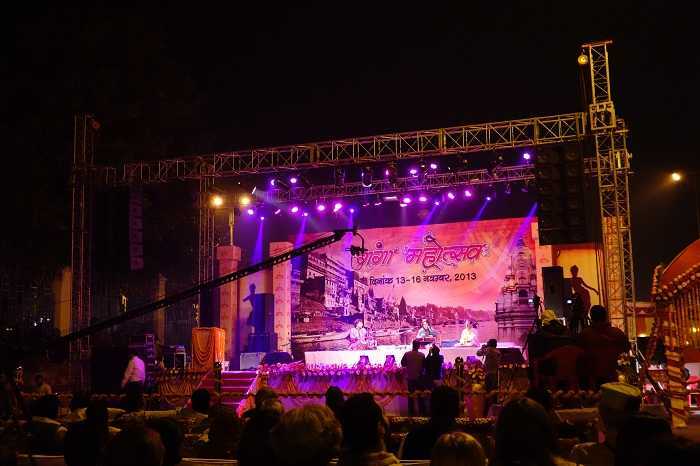 Varanasi comes alive with music, dance and theatre these few days with maestros like Ustad Amjad Ali Khan, Pandit Chhanulal Mishra, Birju Maharaj, Anuradha Paudwal and several others. Gracing the stage with their presence. Each year, throughout the five days of the festival, the who's who of dance, drama and music embellish the aura of the festival with their presence. It's the time to be in Varanasi to soak in the culture of the city. The Ganga Mahotsav is postponed this year and will now be held in January 2019. The Ganga Mahotsav is the best way to savour the delicacies of Banaras at a single place. A mini-fair brimming with the sheer spread of Banarasi chaats, Bati Chokha, Mughlai cuisine and continental treats that Banaras has to offer in one shot. Could we ask for anymore? The reservations in Varanasi are made months before Dev Deepawali. However, if you're planning a trip, the best option would be to get to your bookings right away. As with most holiday destinations, the place may be packed, but you will love every bit of the experience. On the evening of Dev Deepawali in Varanasi, get on a boat and savour the beauty of the ghats adorned with lights as far as your eyes can see. With Zostel (backpacker's hostel) in Varanasi, it has become even easier for Backpackers and solo travellers to find a good place to stay in Varanasi. The city was designed in the shape of a bow, in keeping with the meandering River Ganga. Dev Deepawali in Varanasi is the time to see that bow lit to every last inch. If you're a haggler, get to the other side of the river on a boat and savour the beauty of all 84 Ganga Ghats of Varanasi lit like a fairy lantern. 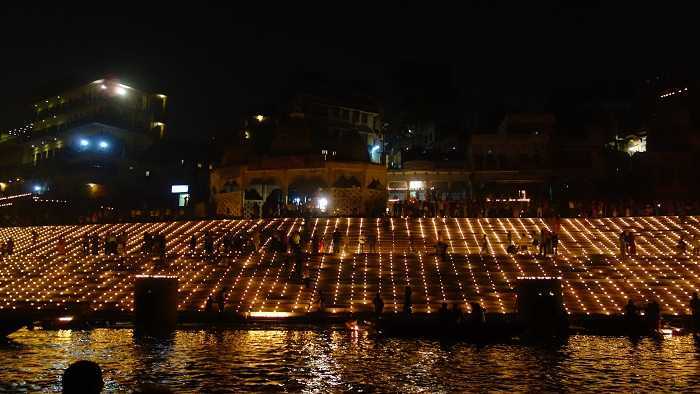 I promise you, Dev Diwali in Varanasi is an experience that you will never, ever forget!